This episode marks the 2011 Summer Season Finale as well as the last episode before Radio Causeway goes on an indefinite hiatus. 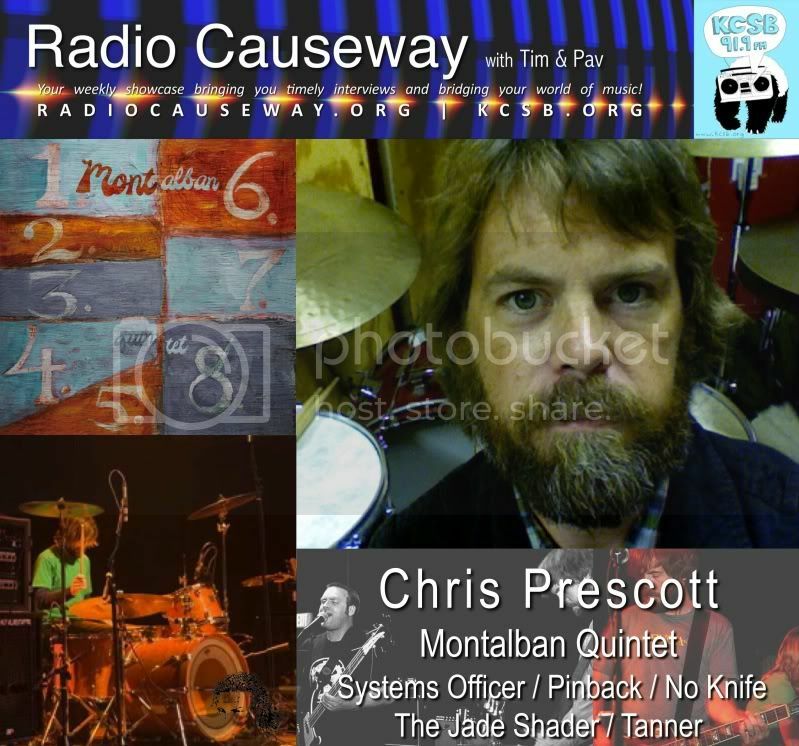 We are excited to have Chris Prescott from Montalban Quintet on to talk about the debut release from the genre blurring band. The band hails from Encinitas, CA which is the surf and skate capital of North County San Diego, CA. The sounds of Montalban Quintet are very diverse and seem to encorporate elements of jazz, post rock, indie rock, field recordings, and spaghetti westerns. The self titled album features: Chris Prescott (drums, guitar and electronics), Carl Prescott (trumpet), Kenseth Thibideau (bass), Jim Weiss (saxophone), Terrin Durfey (vocals), Marjorie Prescott (cello), Nathan Hubbard (vibraphone), and Hermelindo Montalban (percussion). Chris is also currently on tour playing drums with Systems Officer, which is the side project of Armistead Burwell Smith IV (Zack) from Pinback and Three Mile Pilot. Chris also is/was a member of Pinback, The Jade Shader, No Knife, Tanner, and more. Montalban Quintet - 'Besa Sorta' from Chris Prescott on Vimeo. Montalban Quintet - Meditation from Chris Prescott on Vimeo. Plus, The Mullet's Strange News & Yeah! Free Music! The Yeah! Free Music! pick of the week comes from Agassiz, BC, Canada from the band, The Parish of Little Clifton. The song is titled, "Echo Island" off the Septemberish 7" released on Bad Panda Records. Listen live Tuesday from 9-10am pt on KCSB-FM 91.9 in Santa Barbara | KCSB.ORG! Great page, Keep up the great job. With thanks. The site was remarkable. It was pleasant to have read this informative site.